These Energy truffles are an amazing source of energy and nutrients as they are packed with healthy fats and Superfoods! This particular recipe is full of Goji berries & Raw Cacao powder, meaning they are packed with nutrients and antioxidants. 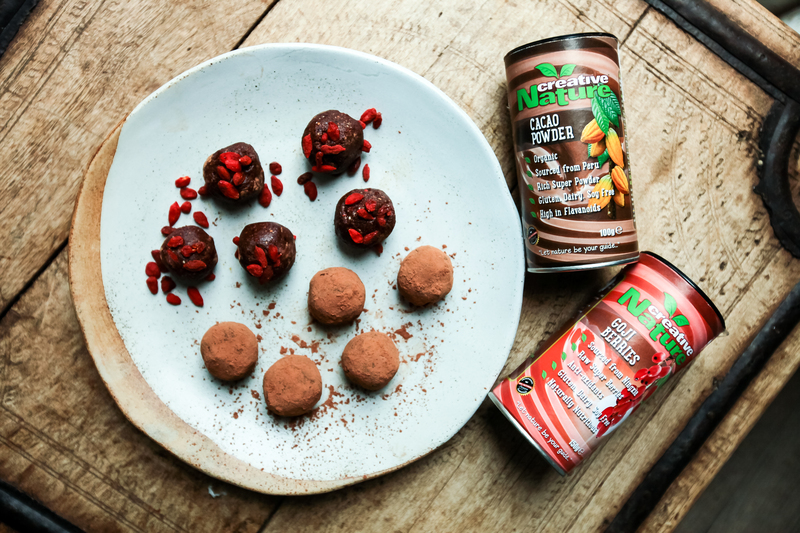 Goji berries are high in Vitamin C, which will help you boost your immune system this January, whilst our Creative Nature Raw Cacao is high in iron, magnesium and calcium! These Energy Truffles are the perfect delicious and healthy snack! Put your dates, almonds and cashews in a food processor and blitz until broken down and well mixed. Add your cacao powder and blitz again. Add goji berries and coconut oil and pulse until everything is well combined. Scoop out your mixture and roll into balls using your hands. Decorate half of the balls with whole berries for extra crunch. Roll the other half in raw cacao powder for more intense chocolate taste. Leave in the fridge to sit for around an hour. This recipes makes around 17 balls but it depends on how big you want them.